Today we present you an interview with Giulio Medda, our General Manager, who is a role model in our organization. Giulio tells us his motto that has been the story of his life and helped him achieve so much: “Live like every day was your last day but plan like you’re going to live forever”. Below, you will find his detailed trip in Office Depot. Tell us something personal about you and your role. I believe that I have too many interests for the free time I have. I have a small daughter and therefore the time dedicated to my interests is even shorter. I spend my free time going to the cinema but today the films that I see are at my daughter’s level. I’ve always been a lover of concerts, cinemas, and sport events. I like the atmosphere there. Obviously, in the past, I would go and see a rock concert, while now I go to see Marsha and the Bear on ice. But sometimes, like 2 weekends ago, I went to see a moto event and I watched the fast motorcycles by myself. I do like to be in crowded places and I also enjoy other things like sport – football, canoeing, diving. Tell us about your role in OD. I am responsible to manage the Shared Service Center from Cluj. During the last few months my role enlarged and I took on the responsibility for managing all the HR operations from Europe. So, that part is more difficult because HR is an extremely large and complex side for an organization. What I would say is that it consists of all of the administration, recruiting and relations with work councils and the legal part of managing people. Now going back at the beginning of your journey in OD, can you share with us what your job title was on the first day? Well, I do have the same role that I had from beginning of coming here. So, I’ve been here close to 5 years now. What is different here is the organization. When I came here the organization was finance-centric and doing things very country based, while today we have a lot more functions and the most of them have gone throughout transformation. We standardized a lot and the work is much more interesting today than it used to be 5 years ago. There are 2 first days in OD. The first one was in late November & December. During my selection process, I was offered to come here for a day to see the organization and the town because it would have meant to move from one country to another. These aspects are to be kept into consideration while being selected here. For example, believe it or not, it can happen that an expat moves into a country and ends up leaving not because of the job but because of the environment (your wife may not like it, you may not find the right things for your children). So my first day was when I came here during the interview process and I was very impressed to see the way that this center developed, I liked a lot the way everyone was friendly and smiling. No one knew (I was here incognito) that I would be the future boss. So, it was an interesting to see the personality of the people because they showed a genuine respect, not the kind that comes with the position. And I really enjoyed the town. I felt like coming to Italy, because of the small environment which Cluj has. People say hi to you on the street and smile at you. And my second first day that I came here was actually the European leadership team to present the future of the Office Depot organization. 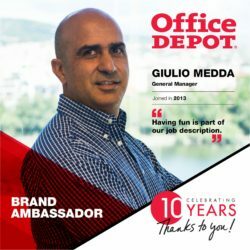 And I actually joined Office Depot in Cluj the day that the European CEO and CFO were in Cluj. To pick up a funny moment it’s a bit complicated because there are too many. One of the things that I like is the fact we have never limited people in having fun. I always say that having fun is part of our job description. I can tell you that at every management meeting that I have there is always a joke that would be funny enough to note it here. I made quite a few jokes on April’s fool day – some of them actually got spread all around Europe. And you know some of the parties – so much fun! To be accepted by all of you because being a foreigner in a certain organization is not easy. It was important for me to see that you, guys, see the benefit of me being here. One of the aspects that I’m really proud is that I have the feeling that you, guys, did not consider me too much the boss of the company but more as an older brother. I get this feeling from the fact that people stop me for asking questions not about the company but for advice on where to go in holiday or things like this. Very often people are also taking my advice when they want to make a decision regarding new roles or positions. That makes me feel that I’m not a guy sitting in an office that nobody sees but someone completely different from that. When I grew up the work environment was completely different from how it is today. Personal qualities like the habit of taking care of things, giving the impression of being trustworthy or genetic make-up like charisma were very important in the organization you were developing. The market back then was much smaller – competing with relatively small number of people. Today, knowledge is really important and I advise people, if they want to reach a good career – this is the same thing I would do with my daughter – to choose the best schools and to learn as much as you can. The world goes so fast today that what you know today sometimes is obsolete the day after. So, you are competing with billions of people today and we have new portions of the world (for example: Indians or Chinese) who are investing a lot in culture and teaching. Tomorrow we will be reachable for certain positions and you will have to fight with people who come from countries who really invested in their learning. I think it’s the perceived instability. 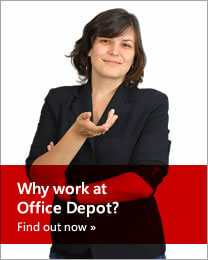 I’ve been 5 years in Office Depot and there hasn’t been any moment when we were completely stable. When I arrived here there was, firstly, a transformation process. Then it was Office Max, business transformations and the acquisition of the European operations by Aurelius. So, I’ve never worked into an environment where you can relax and see things from a relaxed point of view. My job as much the work of other people on my level is based on high level of taking decisions and in such unstable moments it is difficult for those decisions to see the changes in a short period of time because they take time. It may sound funny but I would say people, people, and people. I don’t recall a single time in 5 years where I had to have a strong argument with somebody in this organization overall. I’ve been always dealt with professional and pleasant people. This is the reason why I like Office Depot: people, people and people: the one before me, the one at my level and the ones below me. I have a very important motto that has been the story of my life. It’s a motto that I have identified with when I was already living that way. Once I read it and I said: “That’s exactly who I am”. It starts with a sentence that everybody knows and ends up with a sentence that few are aware of. And the sentence is: “live like every day was your last day” – and that is the way I’ve always lived -, but there is a second part, “but plan like you’re going to live forever”. The first part, I know it since I was 5 years old. If I remember correctly it comes from an Italian song that was popular when I was a child. And I live literally like every day is going to be my last day. But one of the things that is important and probably is one of the reasons why I’ve achieved quite a lot is that I always give myself very long terms for important plans and I always focus on achieving them. And the second part comes from a book which I read a few years ago which completed the story of my life. It’s a sentence that an old politician used to say and I said: ‘Wow, perfectly right!’.